A man and a woman are thrown together in an isolated house sitting atop a remote Norwegian fjord. The man, Sigurd Bagge, works all day at something unknown and unseen by the woman, Allis Hagtorn, who has answered Bagge’s ad for a live-in home helper, as his wife, Allis is told, is away for an unspecified period of time. 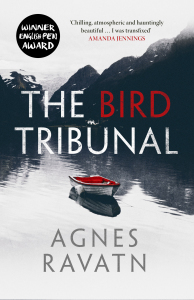 This is the setting for ‘The Bird Tribunal’ by Norwegian author Agnes Ravatn, who won two awards in her country for this, her second novel, which was also made into a play which premiered in Oslo in 2015. Readers could be forgiven for feeling a little claustrophobic at the thought of a story with only two characters in it, rubbing shoulders day in, day out in a remote house, however starkly beautiful the landscape that Ravatn portrays may be. Even more so since the story is told by Allis herself, so there is no chance to have an insight into Sigurd’s thinking, at least not until the novel’s stunning finale. Yet ‘The Bird Tribunal’ is a taut, suspenseful novel that has an incredible depth to it, as Ravatn delicately peels layer upon layer of Allis’ own life story. It is far from a crime novel in the classic sense, but its nerve-tingling tension I found irresistible, just as Agnes Ravatn’s pared-down yet lyrical writing. Allis is in her early thirties, a former historian and TV presenter whose promising career was cut short by a scandal. She is both fragile and stubborn, a woman still shaken by the events that led to her professional demise and the shattering of her marriage, and who is desperate to put them behind her. A simple job cooking and keeping the house and garden for taciturn, reserved Sigurd seems to Allis the best way to forget herself and her troubles and forge a new beginning. Not everyone’s therapy of choice, but Ravatn is brilliant at exposing by degrees Allis’ troubled mind, as the woman struggles to come to terms with her unusual new situation. Sigurd gives her the run of the house and especially the large garden, but demands she doesn’t eat meals with him and generally steer well clear of him, as he goes about his mysterious activity. Sigurd himself slowly develops as a deeply intriguing character, with no past the reader – or Allis – can know about and with a wife who’s conspicuous for her absence, in the flesh as much as in spirit. Sigurd is polite with Allis yet aloof, neither friendly nor unfriendly, but his mind is locked as tight as a safe. As spring turns to summer then autumn, Sigurd gives Allis no indication of how long she will be needed to keep house for him. Allis is wary but content with this situation, as she tries to heal her mind, and as she grows increasingly attracted to the mysterious man. Page after the page, the tension mounts. What does Sigurd do for a living? Why has he left the house with no explanation for several days, returning a seemingly broken man? How will the relationship with Allis pan out, as she, a city dweller, by dint of hard work and sheer force of will turns into a proficient cook, cleaner and gardener for the exacting man? Where is Sigurd’s wife, and why is she absent? ‘The Bird Tribunal’ isn’t a crime novel and, by the conventional genre canon, not one you would classify as a thriller. Yet it is brimming with suspense, created with unerring skill by Agnes Ravatn as she both steeps readers in the haunting atmosphere inside Sigurd’s property and keeps them at arms’ length, revealing only what they need to know to keep turning the pages. Allis, and the readers, are caught in the spell spun by Ravatn around Sigurd’s mysterious life, and the beautiful landscape that envelops them does the rest. There is little plot to speak of in this cleverly weighted psychological novel, and yet it leads readers on irresistibly, to a dramatic conclusion that is as chilling as it is surprising. Well done Orenda Books for publishing this Nordic gem in Rosie Hedger’s beautifully crafted translation, and for letting English-language readers discover an intriguing new voice from Scandinavia.